If you haven’t yet watched the announcement video for the 2012 ride, you should! Not only will it help the rest of this blog post make sense, I love how it brings out the personality in the fantastic group of riders we have been blessed with this year. And it spills the beans on our big plans for FCBA 2012. As of today, we are officially committing to holding two rides next year – one for the east coast, and one for the west coast. I’m excited – no, really excited! We expect that most riders will do one coast or the other (or a segment), but we are purposefully scheduling it so that participants could sign up to do both. Talk about an unbelievable summer. It will be our ride’s fifth anniversary, and we’ve come so far: from a borrowed truck to our own van, from $0 raised to nearly $500,000 (give now, hint, hint! ), from organizing the whole thing in a $0.70 notebook to having laptops and smartphones, from one passionate and crazy Christ-obsessed volunteer leading only slightly-less-crazy cyclists across the whole country to…well, somethings don’t change. So it will be fitting to end next year where the first trip started – in San Diego, California. But one other thing has changed: when I first pitched the idea to Millard Fuller in his office in the fall of 2007, the ride went from having one supporter to two. Since then, about 300 cyclists and 3,000 donors have demonstrated with their sweat, their donations, or both, that this is something they believe in. It now has a life of its own bigger than any one person, which is a beautiful thing. While I will continue to provide leadership for the event and help prepare our Trip Leaders like Allen (who’s done a phenomenal job, by the way), it means that the ride is no longer dependent on me to grow and succeed. I’ll still contribute not because it needs me, but because I love it. Who will ride next year? Who will lead it? What’s the long-term future of this event? Ha, well, good questions. Just as we have from the beginning, we’ll keep taking it one step (er, pedal stroke) at a time, trusting in God to guide and provide. That’s our "master plan." But I think it’s safe to say there are many more Oyee’s yet to come. How about one now…BOTH COASTS IN 2012 – OYEE!! P.S. 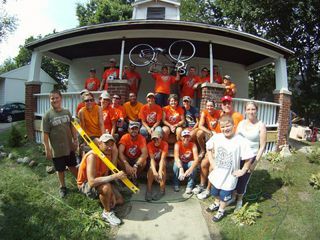 To get the latest updates on next year’s rides, "Like" our Facebook page at www.facebook.com/bikeadventure or email bike@fullercenter.org and request to join our email list.